Bring in the “FDI” !!! For the short-term (1999-2001) industrialist A.C.Muthiah served BCCI as its President, he made one stellar contribution to Indian Cricket. That was the time when Indian cricket was besieged with problems a plenty. Match fixing allegations, pathetic track record in “Away” tests, no significant ODI tournament wins and so on. Raj Singh Dungarpur a very passionate Indian cricketer turned administrator mooted the idea of a “Foreign” coach for the 1st time for the Indian team and in the year 2000, John Wright was appointed coach of the Indian cricket team – a position which was reserved for Ex-Indian stalwart players till then. The rest they say is history. Under Wright, India made the right journey – apart from continuing to be “tigers at home”, they went on to draw a test series in Australia, defeated Pakistan in Pakistan in tests, reached the finals in the 2003 World cup, to name a few milestones. This set the trend for hiring only foreign coaches subsequently for the cricket team so much so that these days I see that even most of the IPL teams have only foreign coaches !!! The recent turnaround of the fortunes of the Indian hockey team is attributed to (among other things) the role of Michael Nobbs, an Aussie and again a foreign coach! If you look at Indian cinema of late, even the forgetful “Ra one” or Shankar/Rajinikant’s Super hit “Robot” boasted of technology which was at par with Hollywood. Recently they say that even in an average movie, the technique in Bollywood is comparable to Hollywood cinema. This has not happened by magic or by Rajini’s wish! A quick glance at the “credits” scroll in any Hindi movie will show you many names of foreign technicians. Though the contribution of the Indian technicians in movies like Ra one or Robot cannot be underestimated, the makers admit that they accessed the best talent available worldwide and that has indeed made the difference. Godrej group’s Chairman Adi Godrej candidly admits that though they broke off ties with P&G and GE at one point of time due to strategic issues, the group strengthened its balance sheet with intangible assets like acquiring knowledge of new management systems, marketing processes, quality control processes,.. from GE and P & G. When Mukesh Ambani puts his feet into organised retail, the 1st thing he does is to tap talent from global retail giants like TESCO,.. to roll out the retail venture in India. So there has been a lot of “Foreign Direct Investments” in India perse and its nothing new! Where I’m coming from is if Foreign hands can value add significantly to our nation’s cause in Industry, Sports, Cinema and many other fields which I’ve not touched upon due to lack of space, why not try some foreign hands to shape up the “Governance” of our country ? Can’t we not hire experts with great track record in economics, administration, and governance in other countries to look at governance issues we have? My premise is that people from outside bring in a completely different perspective and come without a baggage and may pitchfork great ideas which can plug some of our country’s problems. To our netas and may be public at large, this may seem to be an outrageous proposition and one that is fraught with dangers related to nation’s security and other sensitivities. And this could seem to be a very specious argument. After all is nation’s security or economic position same as a game of cricket or a SRK’s flick? Certainly not. If we can’t bring in people of foreign origin to work with us in governance matters, can we do the next best thing? Which is – at least tap the enormous PIO (Persons of Indian Origin) talent which is available outside the country to contribute in solving some of the plaguing governance issues. One sterling example in this context is how Rajiv Gandhi brought in Sam Pitroda in the 80’s I guess as technology advisor and he heralded the telecom revolution in the country! Similarly why can’t we tap Nobel laureate Amartya Sen to consult on policy making and economy? or a Vinod Khosla to bring in an “Innovation culture” in our education system? Shashi Tharoor is another good example of a bureaucrat who is trying to make a difference in the Indian political scene with a different perspective on governance. He has been a PIO for a long while and the time he spent outside I’m sure is shaping his approach to his job as a MP in India. It’s another matter that his too “social” attitude and functioning cost his job as a minister too early in his political career. It’s not to say that we don’t have talented people within the country at present or that people here are not capable. It’s just that some of these people who have a successful track record outside by their experience in other countries could bring in a fresh perspective to solve problems. So my clarion call for bringing in 100% “Foreign Direct Indians” to Delhi for contributing to our country’s Governance!!! Journalist: Why are you opposed to “FDI” in retail? 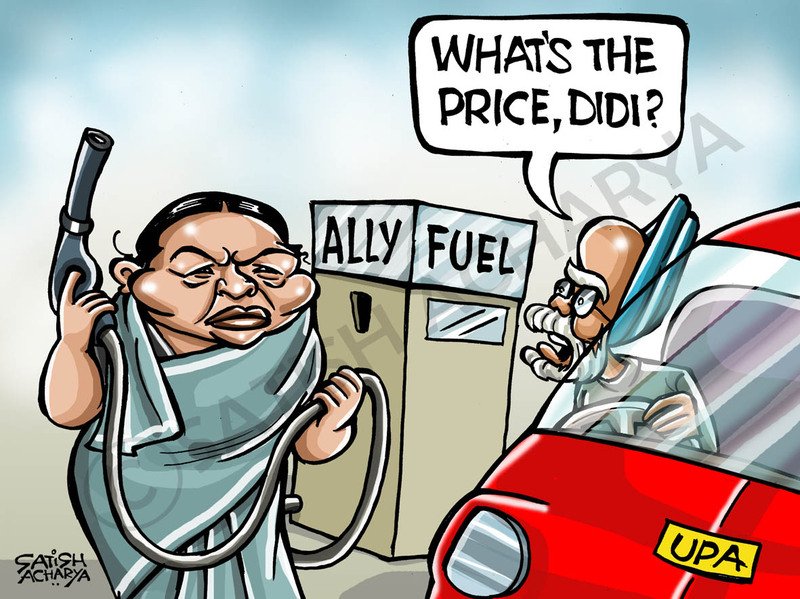 Mamata: How can they propose FDI in retail? If they had proposed “FDIDI” in retail, I would have supported it!!! Very nice.. and correct to the point. I agree that we may need PIO’s who have made a mark outside India to fix India’s governance problems. The only reason PIO’s may fare better is that they have lived outside India and can bring in the experience. That’s all. I am a PIO and I feel pathetic when I visit my hometown.. rotten streets strewn with garbage everywhere. can we clean our cities? yes we can, with determination. Indian intellectuals can fix problems. Former Reserve bank governor C Rangarajan was the Governor of AP at the request of CM Naidu and much of the economic boost of Hyderabad comes from the duo’s working together. Ramesh, thanks for your prompt feedback. Its like some external management consultant coming into your company and telling you what needs to be done !!!! Foreign capital can do a lot of wonders for India. But the only thing foreign capital requires is stability in policy and transparency. Also the courts need to function and give justice quickly and effectively. Right now none of this is happening. Our babus run the nation like it is their personal fiefdom. However with Anna Hazare and international arbitration launched by foreign investors such as vodafone and Childrens Investment Fund against Coal India we should see the IAS moving towards transparency in Governance. It is a big step forward for the nation. I also write on what you write. Perhaps we can exchange thoughts on this nation called India. India needs a lot of work to be done in order to come up to the global stage. We are way behind the others. Naresh, thanks for your feedback and link to your blog, will read your posts ! Generally I do not read article on blogs, however I wish to say that this write-up very pressured me to try and do it! Your writing taste has been amazed me. Thank you, very great article. Very nice indeed! And Anand why not. In any case the way things happen.. its anyways trial and error so why not try “Foreign Direct Indians” at the helm who atleast will bring in some fresh perspective in the running of the day-to-day operations. It is a good read with good analysis. Thank you. Hope R. Rajan do good to RBI like you have done it for Brother. Besides he looks smart like you ! Thanks Lawrence for your feedback on the post !